Learn about the Wisconsin Dells by reading Wisconsin Dells - Nature's Wonderland, by Charlie Spence, WTA member and travel writer. It features a mini, but thorough tour of the destination, plus all you'll need to know to plan your trip, including getting there, objective information on places to stay and eat, and things to do. At the end of the article, we've provided a summary of the contact information for your easy reference. Enjoy! The river cruise takes visitors past miles of unusual rock formations. Photo courtesy of Wisconsin Dells Visitor and Convention Bureau. It is a 15-mile stretch along the Wisconsin River that has some of the most unspoiled and spectacular scenery and diversified recreation opportunities to be found in such a compact area. The Winnebago Indians had a name for it—Nee-ah-ke-coonah-er-ah—meaning where the dark rushing waters meet. Early French settlers named this area the “Dalles,” meaning flat rocks. You could easily call it one of your favorite vacation spots after you experience the folklore, the fun, and the fantasies of The Wisconsin Dells. 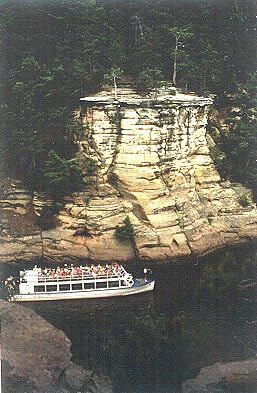 For more than 150 years Wisconsin Dells has been entertaining travelers who come to this area for its unique heritage and history in addition to the grandeur of the rock formations, unspoiled countryside, and numerous show attractions. Near The Dells, Chief Black Hawk was defeated in the Black Hawk War of 1832. A young army officer involved in the campaign—Jefferson Davis—was destined nearly three decades later to lead the Confederate States in another bitter and bloody conflict. At about the time the Civil War ended, Henry Bennett was born. As a young soldier he started taking pictures of the unusual landscape and rock formations. He continued photographing and his pictures became so popular that tourists began to travel to this site to see the wonders first hand. Tourism began. The area includes two small towns, Wisconsin Dells and Lake Delton. The year-round population is only about 4,000, but don’t let that number fool you. During the summer months and special activities, the population often swells to more than 30,000. Include the campgrounds and The Dells area can accommodate up to 50,000 visitors. The number and variety of lodging facilities attest to this popularity. Once you settle in at any one of the 140 hotels or motels you may start enjoying the sights and activities. 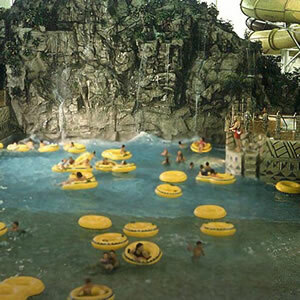 Bumper Boats are just one of the fun attractions at water parks. Probably your first will be a boat tour. Choose a leisurely cruise, power along in a jet boat, or tour the lower Dells and the lost city of Newport in an Army Duck. Narrators point out the different formations, and relate the area’s history and lore as you pass such sights as Witches Gulch, Hawk’s Beak, and Cow in the Milk Bottle. For a panoramic view that will have you oo-ing and ah-ing, take a trip over The Dells in a hot air balloon. After the rides on the river, climb aboard a horse-drawn wagon and tour through the narrow passages of lost canyon. Spectacular scenery is but one of the reasons this area is so popular. Nature lovers have a variety of places to visit. If you are brave enough, you may feed any of the 19 reptiles at Alligator Alley. Take a tour of the Nanchas Elk Ranch, which is home to more than 100 elk in the scenic rolling hills. Or visit the Wisconsin Deer Park where you can feed, pet, and photograph a myriad of antlered creatures and game birds. You will find more than just nature’s creations to make your visit unforgettable. At the Circus World Museum you will find the world’s largest collection of restored circus wagons and big tent memorabilia. This is located in the original winter quarters of the Ringling Brothers Circus and provides daily performances. At the H.H. Bennett Studio and History Center, six interactive exhibits trace the evolution of the Dells area. Study the science of photography, and step aboard a steamboat to experience The Dells at it was before the hydroelectric dam was completed in 1909. Amusement parks and shows offer pure relaxation and rides from go-carts to bumper boats and roller coasters. Be sure to take in Tommy Bartlett’s water ski show, which has evolved from water ski jumping into what is now a world-known thrill show that has performed in 28 countries. If you like to try your luck in other ways, casinos are available in the area. There is still a strong Indian culture and special ceremonies are held frequently. Try to time your is it to be sure of attending one these Native American festivals. The Dells is home to 70 attractions, 80 restaurants, and 140 hotels. For a more complete look at the area, log on to the web site: www.wisdells.com. On your first visit to The Dells, you will find such an array of things to do and see that the best you can do is give this amazing area the once over lightly with a promise to return often. The nearest airport with commercial service is Madison, Wisconsin. To The Dells is about a 50-minute drive. To visit by car, log on to The Dells website shown above and click on "Maps and Directions" for specifics from cities throughout the Midwest. Buckly House: variety of accommodations: $59 - $140. Park Plaza Baraboo: Near Circus World and water parks: $74 - $129. Parkway Motel: $38 - $48 Monday thru Friday, add $20 for weekends. Sandman Inn: $38 off season; $98 in season. Luna Inn and Suites: $75 - $105 off season; $95 - $145 in season. Some have kitchenettes. Camelot Hotel and Suites: Castle-like architecture; $45 - $255. You can also check rates and book your room and rental car at WTA's Online Travel Booking Service. Deep hotel discounts may apply. Take your choice of 80 restaurants. The usual chains have outlets. Here is a sampling of the casual and fine dining spots. Casual places like Country Kitchen and Houlihan’s offer items on the menu ranging from about $5 to $15. For more elegant fare, visit places like Ishmala Supper Club or Wally’s House of Embers. Notice: This information is current as of January 2003. It is recommended that you contact the numbers, and/or visit the websites above to determine any changes to the information.